Welcome to our fall porch, friends! I’m glad you’re here! 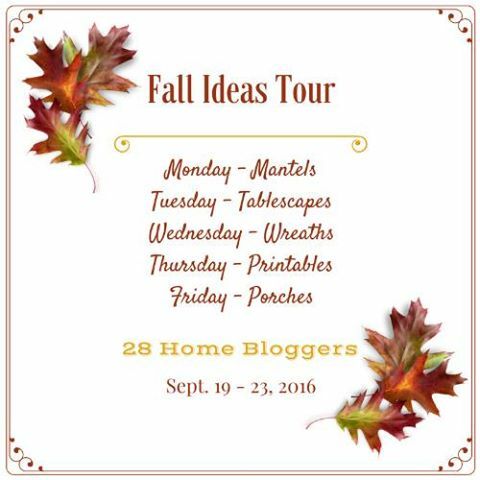 Today I’m joining some of my favorite bloggers on the Fall Ideas Tour which has been going on all this week. 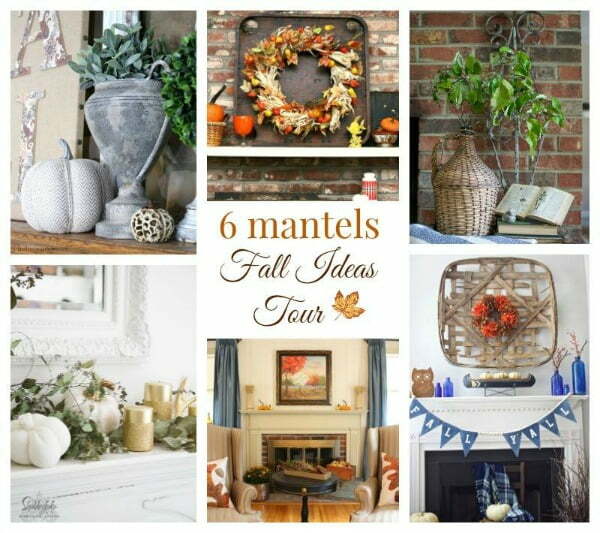 This is the second year that I have participated in this tour, and it is jam-packed with lots of fall inspiration. There’s a little something here for everyone. 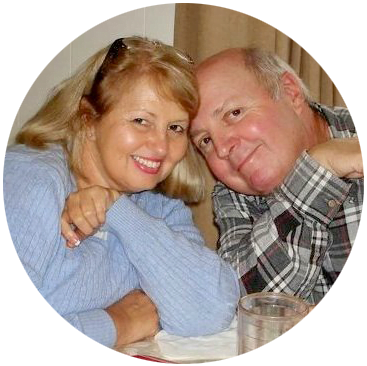 The schedule and the links for each day are located at the end of this post, and I hope you have a chance to visit all my friends. 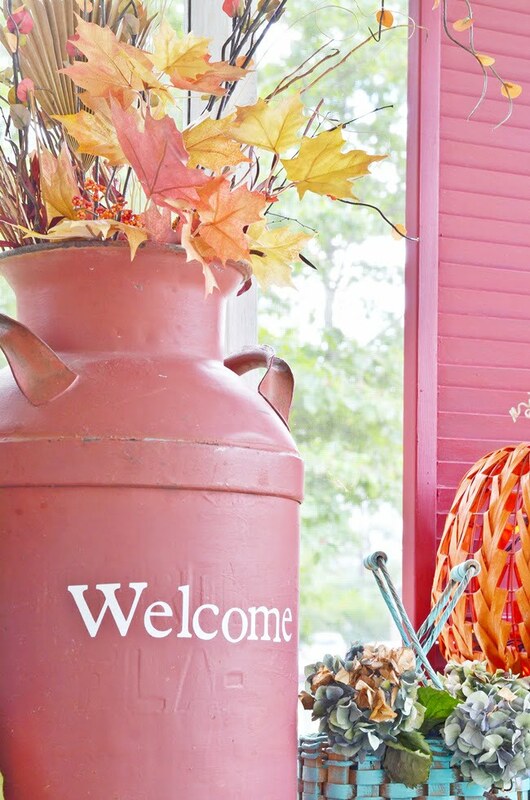 Today I’m sharing our front porch all decorated for fall. Yesterday was the official start of the season, but it couldn’t get here soon enough for me. I love the change in the weather, the beautiful blue skies combined with golden light, football, and fires in the fire pit. So I have very festively decorated the porch as a celebration of all those fall things that I enjoy. 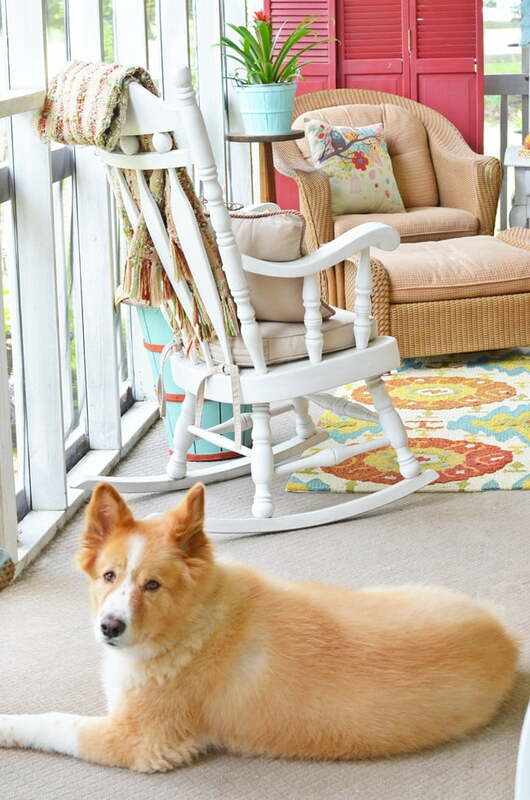 The colors that I selected were all driven by our new outdoor rug from Rug Studio. Playing up the aqua in the rug, I decided to use a lot of it this fall. 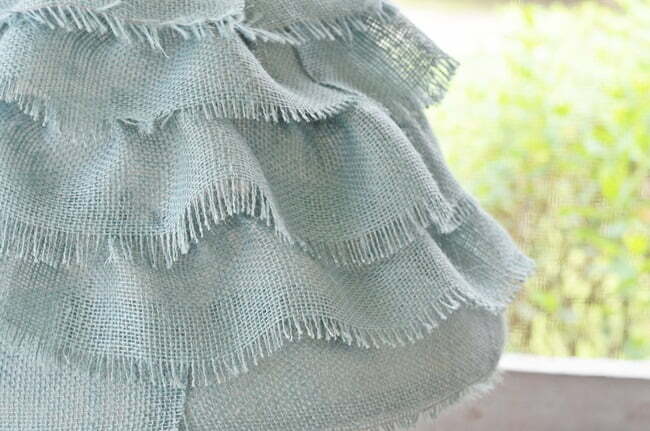 I found some burlap and promptly made another burlap ruffled shade. The directions on how to make one are HERE. 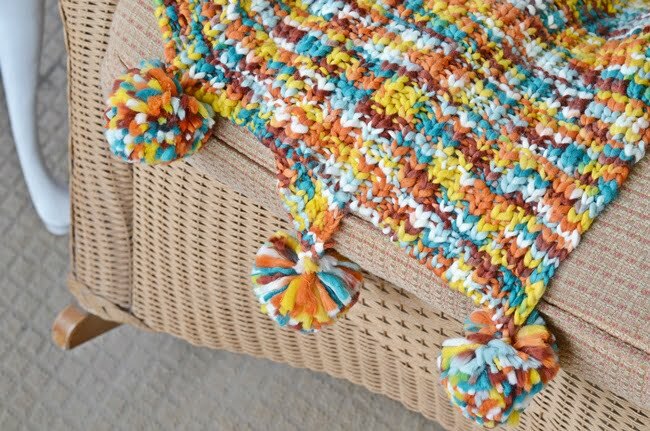 Back in August, I found this throw with these adorable pom poms on it that had all the same colors in the rug. There have been just a few chilly mornings that I’ve been able to use it but I expect to be able to wrap myself in its softness soon. Imagine my surprise when I found this (affiliate link) pillow cover on Amazon last month. Perfect colors at a perfect price-$5.99! No kidding! I couldn’t believe that price, either! 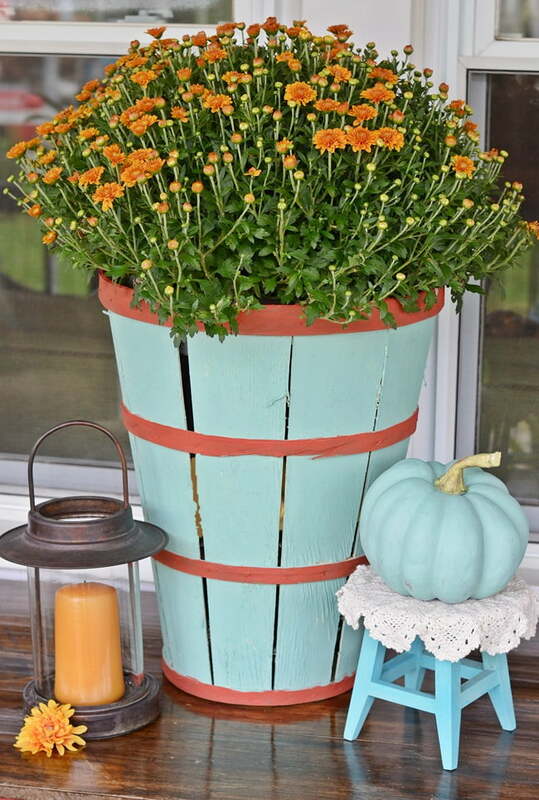 I already had this bushel basket and it got updated with a little aqua paint. It makes a great mum holder! We grew some pumpkins in our garden this summer but only 2 developed and then rotted. 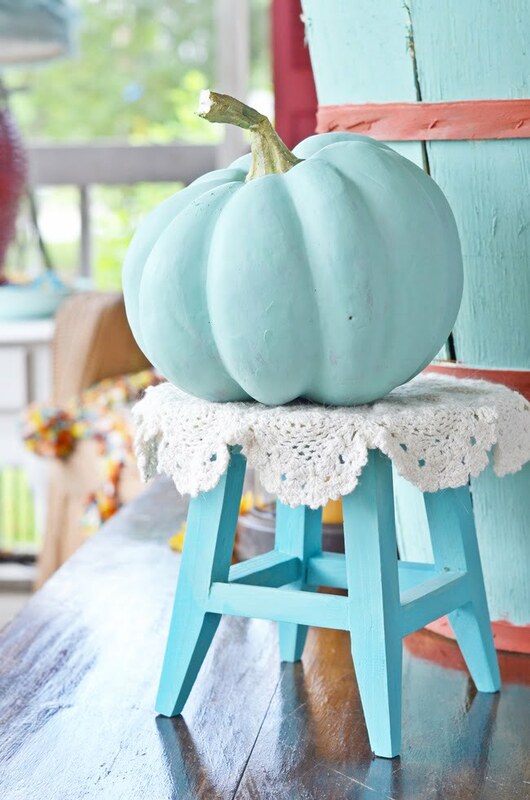 So I had to resort to using some faux pumpkins, painted aqua, of course! 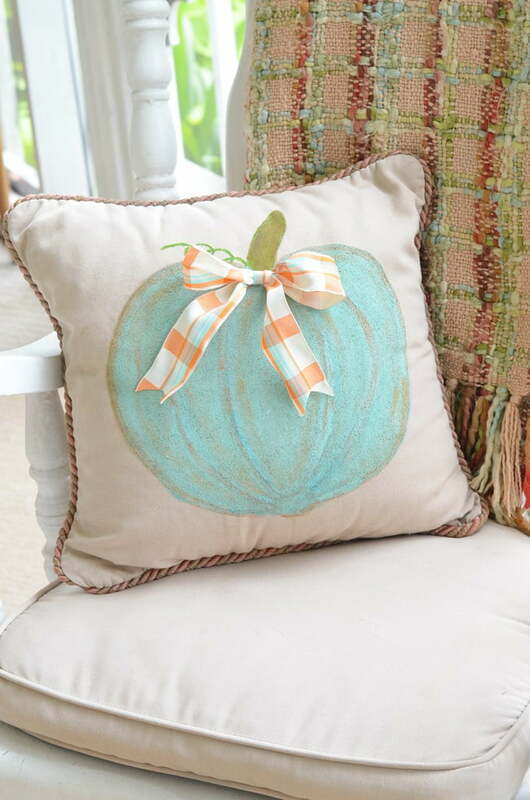 In the rocking chair is a pumpkin painted pillow! It used to be orange but not this year! 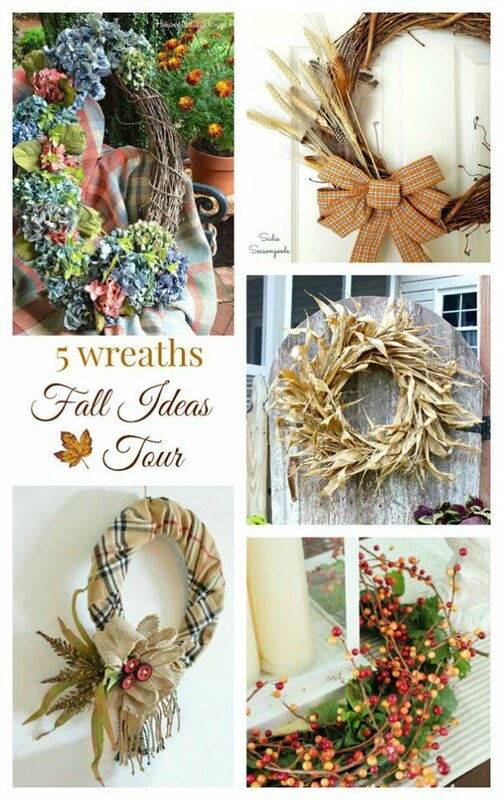 The ribbon on it matches the ribbon that I used on our Fall Rake Wreath. 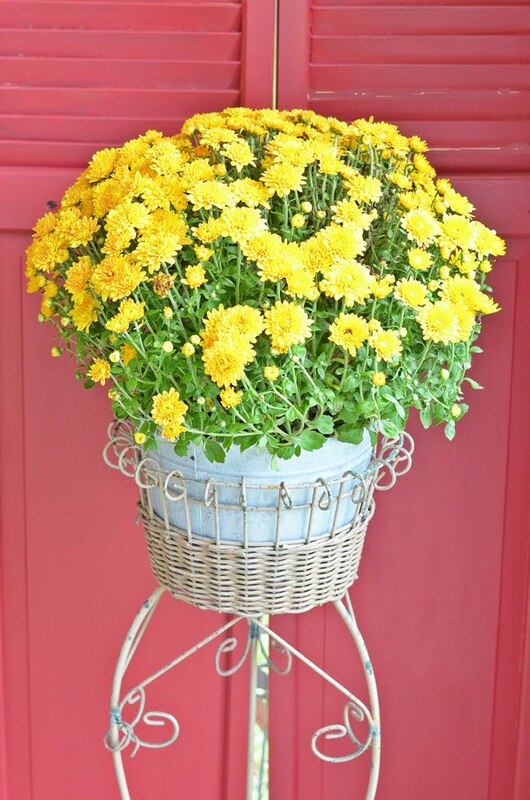 Beside the rocking chair, I used another bushel basket as a side table. An old metal piece from a discarded light fixture serves as a top. Did I mention that I don’t throw away anything? 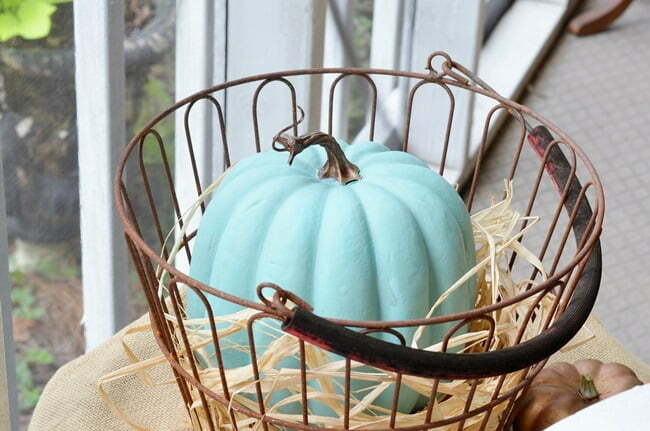 Another aqua pumpkin in a wire basket! 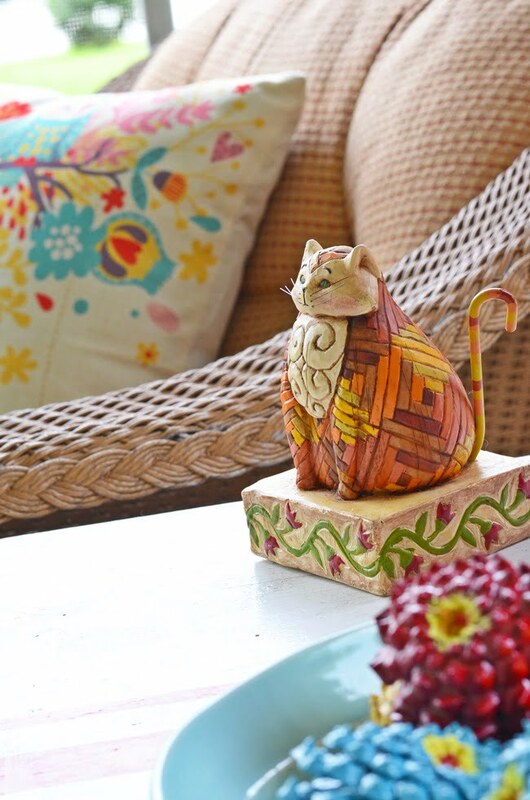 This little cat figurine adds a little autumnal touch, don’t you think? You know how we love our critters! Lucy, our dog, and our cat, Henry, love our front porch, and it’s the first place we head out onto early each morning. Around the front door is a grapevine garland that gets dressed for each season. Right now it’s adorned with more of those pine cone zinnias that we made. You can find the directions on how to make them HERE. The old wheelbarrow got a wash of aqua paint and is holding the topsy turvy pumpkins this year. On the other end of the porch is our eating area. The table has been cozied up with an old quilt. On the serving table is a vignette with this sign that says it all! 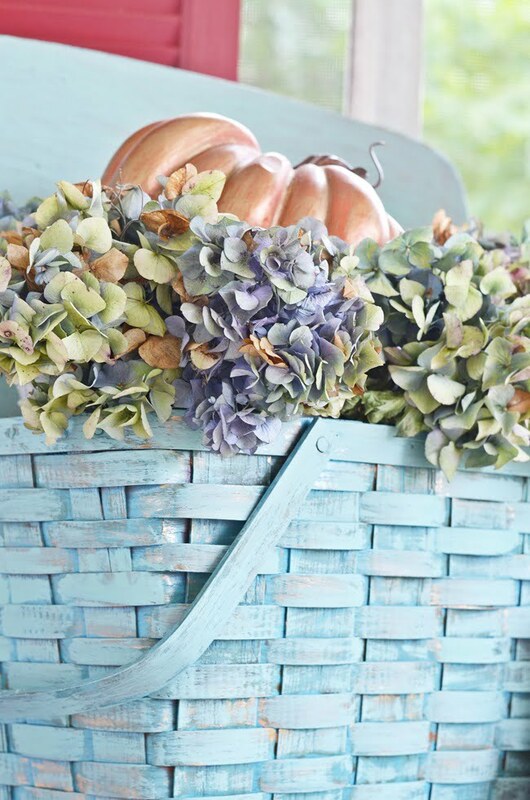 Dried hydrangeas from the yard have been tucked into a vintage picnic basket along with a faux pumpkin. I’ve developed a “thing” for picnic baskets lately and have painted quite a few this year. You can see some of the layering of different colors on the side of this one. Another pretty mum in the corner of this end of the porch. As I was finishing up photographing our fall porch this afternoon, we had another downpour of rain. The lights in the orange pumpkin cast a warm glow on all the festive, autumnal colors on our fall porch. I hope you enjoyed the tour. 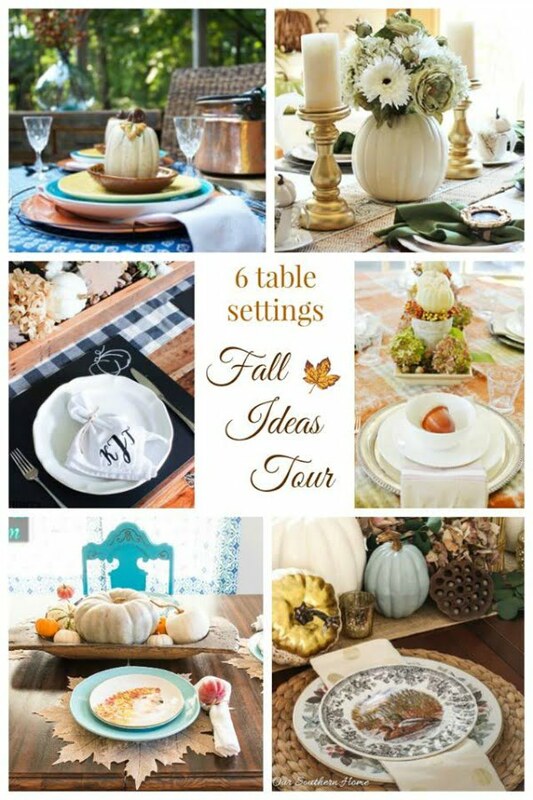 Be sure to check out the links below for more fall ideas! The home is simply beautiful, love the mixture of aqua color with other bright and cheerful colors (: Beautiful, simply love it! Very cute porch. Never would have thought of aqua as a fall color, but it works! I love your porch but I actually came to find out about the topsy turvy pumpkins. Can you please tell me more about those? Beautiful! Love all the aqua touches! Love the porch with all the aqua accents! Bet you could catch quick snooze out there with that rain coming down!! Happy Fall! Have a good week! Jane, I love your porch! Each item is a masterpiece unto itself. You have used so many different colors and textures and your porch is wonderful! You always manage to amaze me with the beauty of your projects. Your porch is so pretty and cozy. 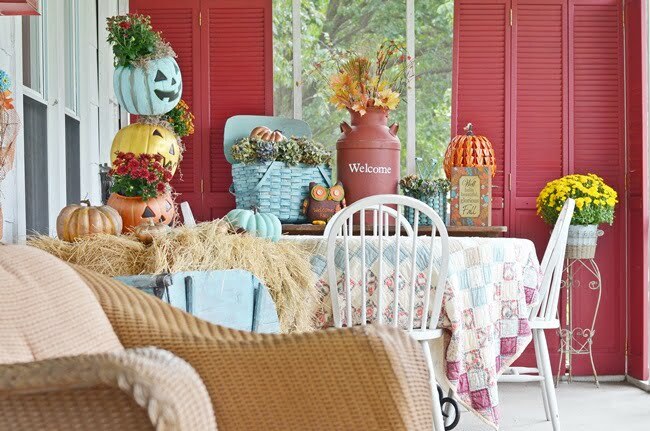 I love it all…the pillows, the pumpkins, the baskets and all those flowers. I would want to sit there and read and sip a cup of tea, or iced tea in this weather! Thanks for joining our tour. I always love seeing your projects and decor. I LOVE your colors! Beautiful! You make me want to paint everything aqua???? 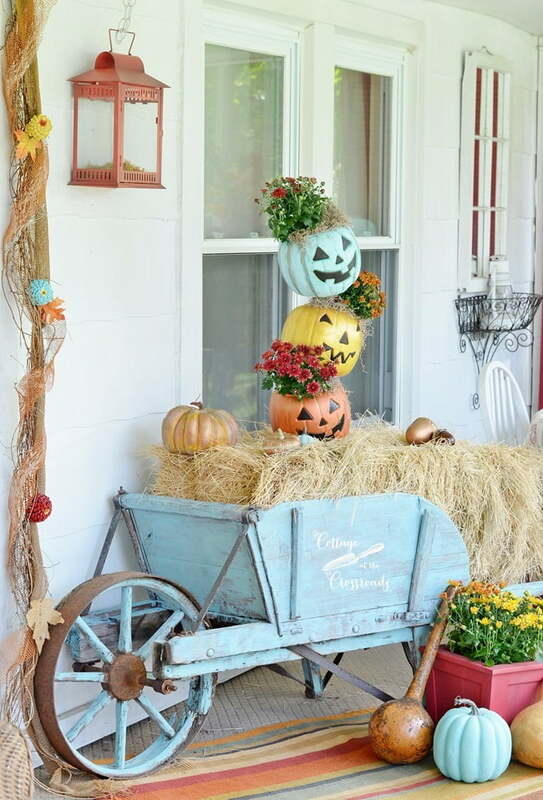 Jane, I love seeing your beautiful porch for every season…it is no wonder that you and Leo head out there first thing in the morning as it sure does start your day off right being on that glorious porch…LOVE the topsy turvy pumpkins!!! 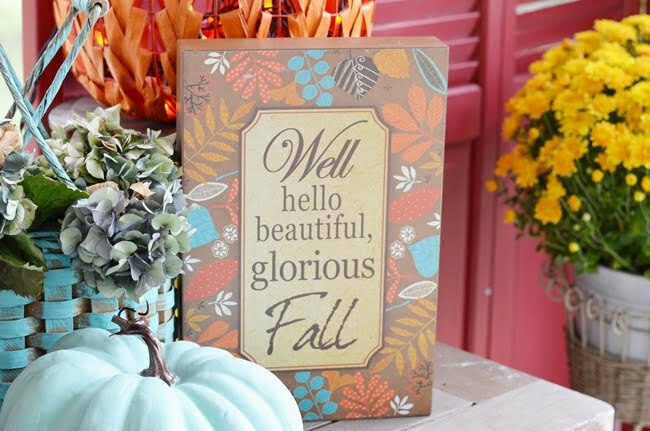 !….Happy Fall…I just wish our temps would feel like Fall! Have a great weekend! Jane, I just love your color scheme! What an inviting looking porch. And that ruffled lamp shade is adorable!! Oh my goodness, love, love, love your porch!!! You know I love the colors you used and I see the throw we both have a fondness for! 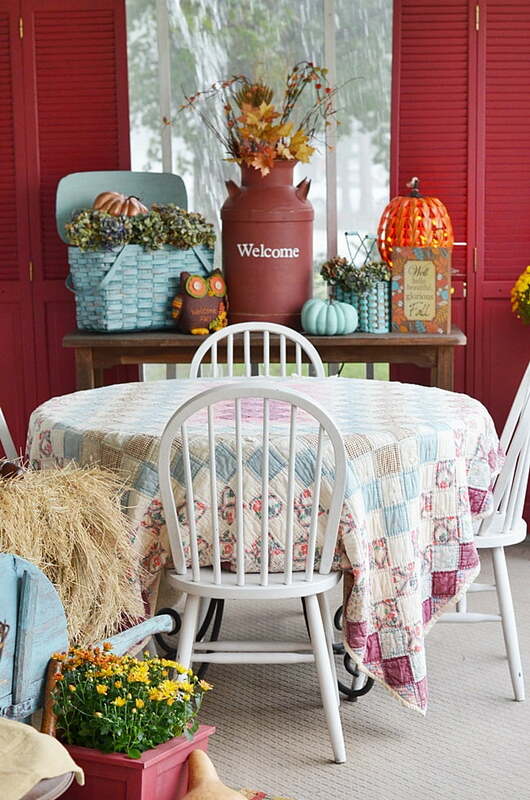 I really love the quilt you used as a table cover and your milk can! Pinning, pinning, pinning!!! This has to be the prettiest yet!!!!!!!!!!!!!! The aqua is amazing with the gorgeous … traditional colors of fall !!! That bushel basket that you painted is gorgeous !!!! I agree with Leo. This is your best one yet. I love that porch! 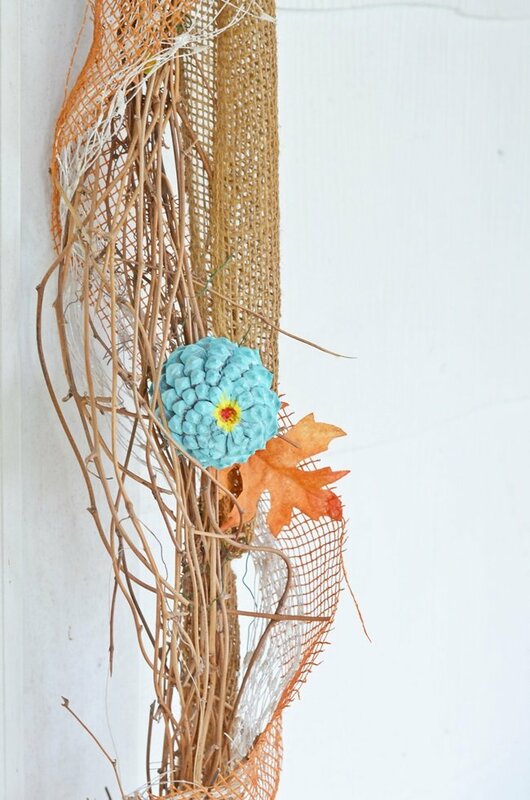 The dried hydrangeas are especially lovely and that pumpkin pillow is adorable. I think it’s your best effort yet. Really nice. Jane, I have a huge porch, but I don’t do nearly the beautiful job you do on yours. Gorgeous!! LOVE, LOVE, LOVE!!! ???? EVERYTHING!!! You have given me ideas to work with what I have,,, my deck needs sprucing up for sure???? We are still in the 90’s here in Texas, still love the fall colors though AND LOVE the turquoise accent pieces❣❣. Can’t wait to view all the other posts. THANK YOU for sharing your talent! ???? Charming!! 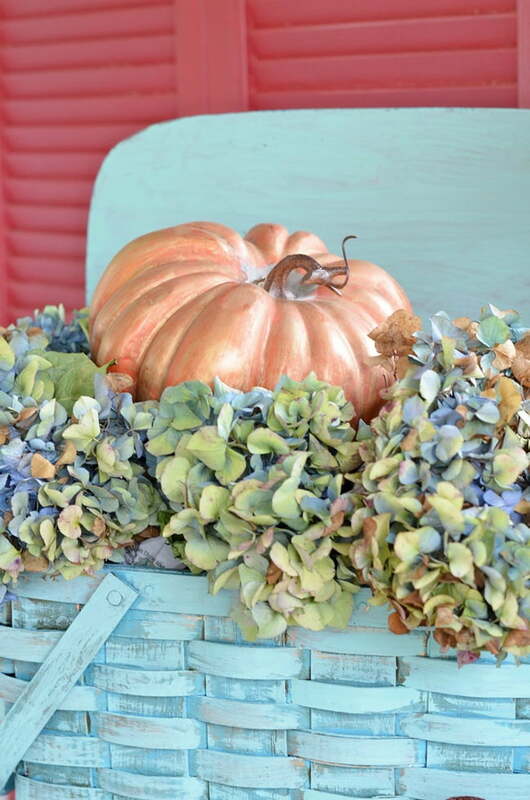 I especially like the aqua pumpkin nestled in the dried hydrangeas. Jane, I absolutely llove everything about this porc. So inviting, you might find me out there with my coffee one morning when you come out! 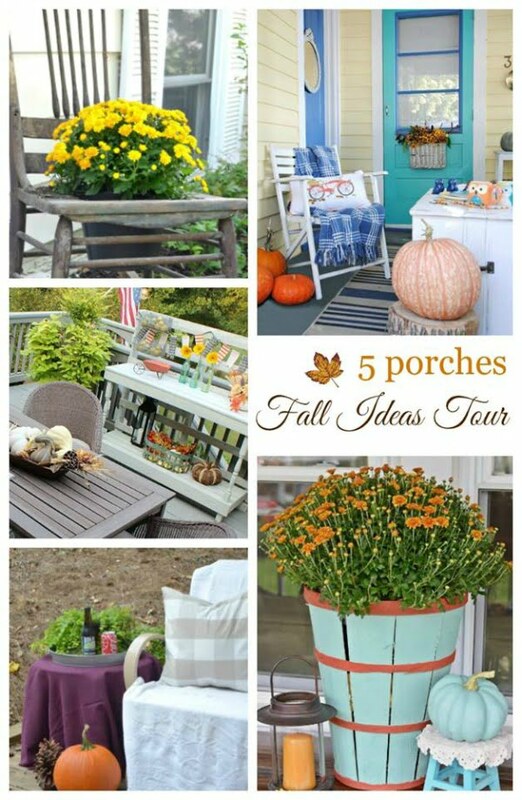 Your fall porch is absolutely adorable, Jane! My favorite color is Aqua, so I’m really enjoying your front porch. I love the softer colors you’ve chosen. This space is so inviting, I might just stop by and sit awhile ! 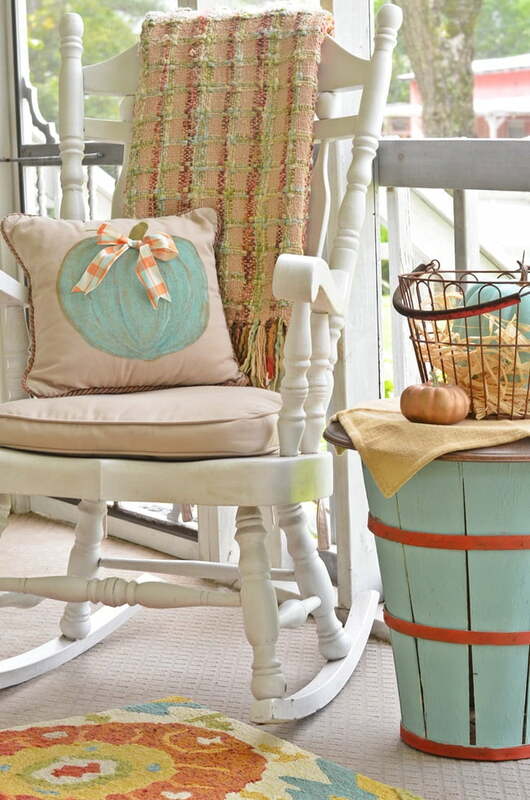 This is hand down the cutest porch I’ve seen for fall yet! LOVE IT! And love the colors you used! May have to get out the paintbrush to spiffy up one of my picnic baskets now! Your porch is just awesome! I love it. The aqua and orange goes together so well. I can understand why you spend so much time there. i’d never want to leave. Thanks for sharing. Your porch is gorgeous! I love all the colors! It is beautiful for fall! I would love to relax there! Thanks for sharing it with us! 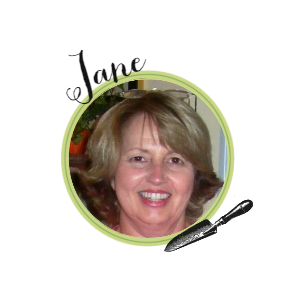 Jane – your porch is beautiful! We love the aqua paired with the orange and coral. 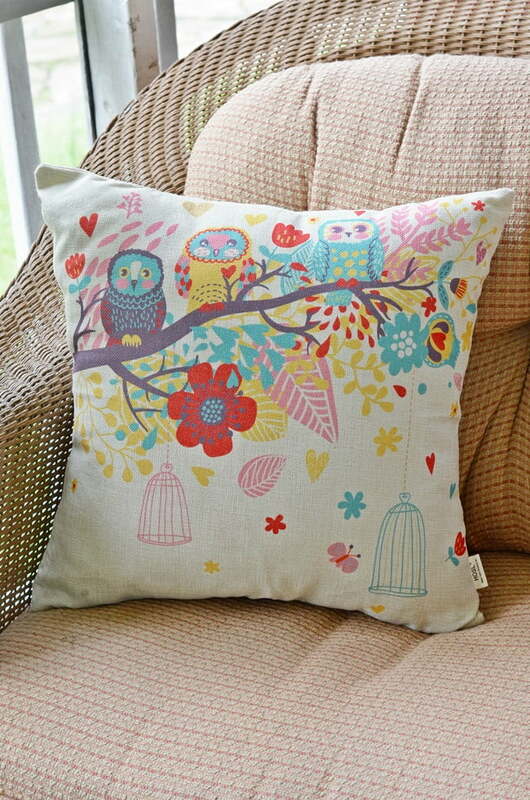 Don’t even get us started on the throw and that adorable pillow cover…super cute! 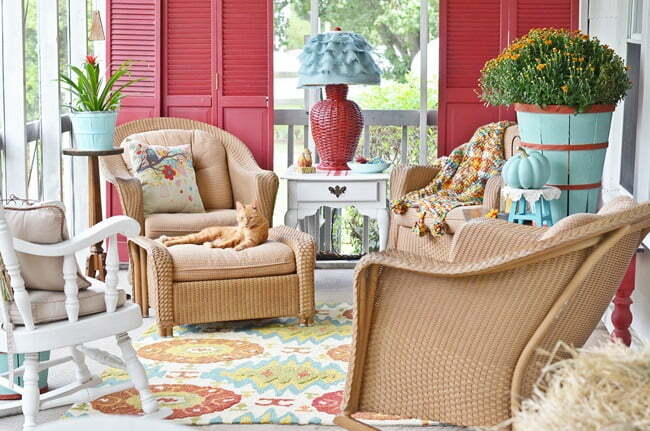 Enjoy your cool mornings on this beautiful porch. Oh my goodness, I just want to spend all day on your porch! I just adore all the touches of aqua and that your furbabies bring a pop of soft orange. 🙂 Happy Fall tour to you! Your porch looks so pretty, Jane! I love the softer colors of fall that you used to decorate it. I hope that you enjoy many cool mornings and evenings out there very soon.